A few years back I worked in a restaurant that specialized in seafood in Beaufort, South Carolina. 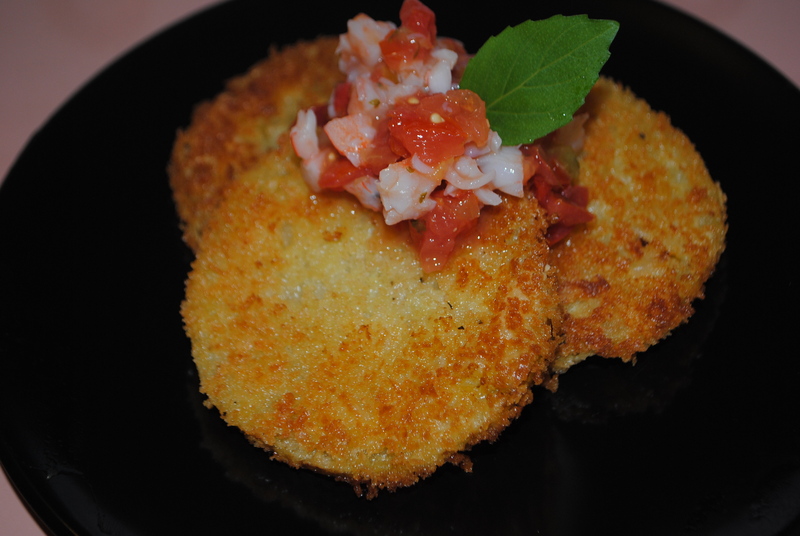 One of my favorite menu items was their fried green tomatoes with shrimp salsa. The taste was immense! The other day while shopping I spied with my little eye a basket of green tomatoes at the grocery store. I had to get them and create deliciousness to share with the world. Here is a super simple recipe I promise that you can make yourself and be proud of! Let me give it to you easy, wash and dry your tomatoes and then slice them at about 1/4 inch thickness. Set them to the side and turn on your pan to medium heat, added olive oil to the bottom so that there is a thin layer. Prep three stations: 1. Place your flour on a plate, for dredging. 2. Get a bowl for your egg and milk, mix. 3. Another bowl or plate for you panko and parmesan cheese mix. Then it literally is as easy as 1,2,3. Dredge your slices in the flour, dip them in the egg mixture and then evenly coat your tomato slice with the panko crumbs. Top with a little salt and pepper and pop those puppies in the pan. Don’t over crowd and make sure you check for even browning. Once they are nice and browned, transfer them to a plate lined with paper towels to help soak up excess oil. You could use regular breadcrumbs, I just enjoy panko because it gives them such a crunch and it’s an awesome balance because the tomato inside and nice and juicy. Easy, right? Only one thing can be easier, the shrimp salsa! It’s as easy as cooking, peeling and chopping up 6 medium shrimp and tossing them into a cup of your favorite salsa. Homemade or in a can, it doesn’t matter. Mix it up and serve either on top of your ‘maters or on the side. Sounds way more fancy than you’d think it’d be with so little work involved. This entry was posted in Food, Health and tagged cooking, easy, fried, green, healthy, panko, salsa, shrimp, simple, southern, tomatoes by themcdorkins. Bookmark the permalink.